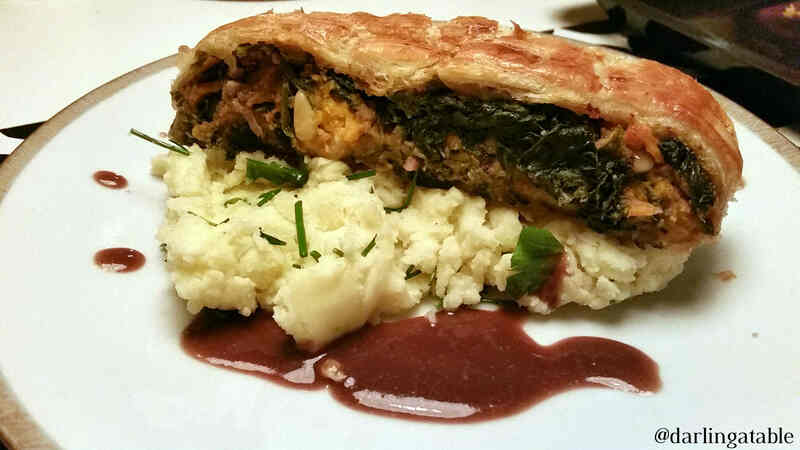 Vegetarian Wellington – Darling, à table! This Christmas everything was vegetarian and “le chef-d’œuvre” was this Vegetarian Welligton originally made by Andy Waters from “Great British Chefs”. As much as I like a good “côte de boeuf” this vegetarian wellington was so delicious, rich and fresh in the same time, that I will definitely consider to cook more vegetarian at special occasions. I’ll put here only the wellington recipe but in the photo it was accompanied by a herby mashed potatoes and a delicious vegetarian gravy (also picked from the Great British Chefs website which became my favorite recipes website). 2. Using a pestle and mortar, bash the rosemary and thyme lightly for 1-2 minutes to release the flavor. Mix with 1/2 tbsp of olive oil and spread it over the sweet potatoes ensuring that the mixture is well spread all over the potatoes. 4. Meanwhile, place a saucepan over a medium heat and add 1 tbsp of olive oil. Once hot, add the onions along with a pinch of salt and pepper.